99 Really Corny Jokes For Kids (And Adults!) - The Corniest Jokes Ever! Corny jokes are great! Yeah, they make you groan at their awful cheesiness. But we bet when you hear really corny joke you can't wait to tell it to your friends. Even if it's just to see them roll their eyes at how bad your joke is, it's still funny just to watch their reaction. And corny jokes aren't just for kids either. After all, Dads are notorious for telling bad jokes! With that in mind, we've gathered together a huge collection of all the best corny humor out there. Our Dads would be so proud of us! What did the mayonnaise say when the refrigerator door was opened? Close the door, I'm dressing. What's a skeleton's favorite musical instrument? The trom-bone. 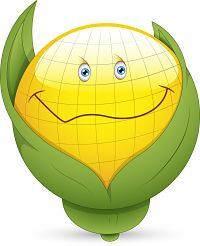 Why is corn such a good listener? Because it's all ears. What did the first plate say to the second plate? Dinner's on me. Why can't you trust the king of the jungle? Because he's always lion. Have you heard about the pregnant bed bug? She's going to have her baby in the spring. What's E.T. short for? He's got little legs. It's Jamaican hairstyle day at work tomorrow. I'm dreading it. What did the swordfish say to the marlin? You're looking sharp. What's a didgeridoo? Whatever it wants to. Why shouldn't you play cards on the savannah? Because of all the cheetahs. Why don't penguins like talking to strangers at parties? They find it hard to break the ice. Did you hear about the population of Ireland's capital? It's Dublin. Why did the mobile phone need glasses? It lost all it's contacts. What did the hat say to the scarf? You go ahead, I'll hang around. What did the baby corn say to the mama corn? Where's pop corn? What did the triangle say to the circle? You're pointless. What did the chip say when he saw the cheese stealing? Hey, that's Nachos. Why wouldn't the shrimp share his food? Because he was a little shellfish. Why couldn't the sesame seed leave the casino? Because he was on a roll. Why do seagulls fly over the sea? Because if they flew over the bay they'd be called bagels. What's the difference between America and a memory stick? One's USA and the other's USB. What did the big chimney say to the little chimney? You're too young to smoke. What's a bear with no teeth called? A gummy bear. Why couldn't the bad sailor learn his alphabet? Because he always got lost at C.
What did the first street say to the second street? I'll meet you at the intersection. Why are teddy bears never hungry? Because they're always stuffed. What's the best time to go to the dentist? Tooth hurty. What did the red light say to the green light? Don't look, I'm changing. What do you call a T-Rex that's been beaten up? Dino-sore. What did the policeman say to his belly button? You're under a vest. Why can't your nose be 12 inches long? Because then it'd be a foot. What's an astronaut's favorite part of a computer? The space bar.